To those who subscribe by email to my blog, my apologies – I had left this week’s blog posts with just the photos and links, intending to add text before they went live, and oops! Yeah. I’ve been out from early morning til late at night each day, and fell into bed without checking my blog posts. Gah! Text has been added to the web, so if you’ve missed that aspect of my blog (not sure how many folks read the words! ), you can go back and read them on the web. This stamp sparked a little idea in my mind – have you seen all the pineapples everywhere? 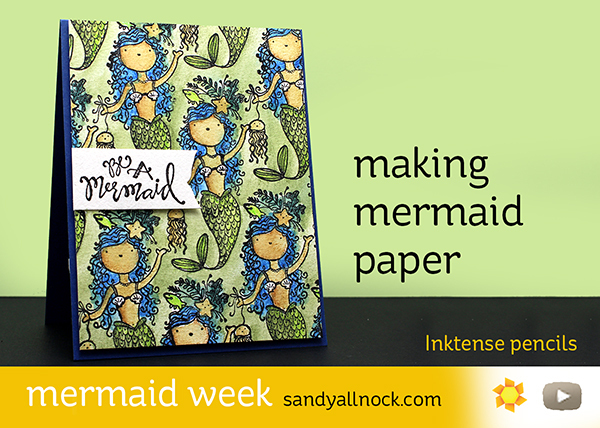 Well this mermaid felt like it had a little of that flavor, and I could “see” it as patterned paper! I got out some Inktense pencils to color it….hope you enjoy the process! Watch the video below, or click HERE to see it in HD on YouTube. I follow you on your blog so I get a notification as soon as you post something and I can’t wait to go see what you’ve posted or go watch the video you’ve posted. So to say I’ve learned a lot is an understatement and hope some day to take a class from you when you come back to Maryland and teach at Queen’s Ink or maybe even hopefully one day look at teaching at the only scrapbook/cardmaking store left in the state, Photo Scraps in Eldersburg, Maryland because they are a great group of ladies and are doing a great job keeping the store open!! And yes they know me by name, really they do, LOL!! Anyway I just wanted to say that I love Mermaid week and hope you could do a Fairy week eventually 🙂 I love Mermaids and Fairies and glad you did this!! Thanks for all you do for this community. 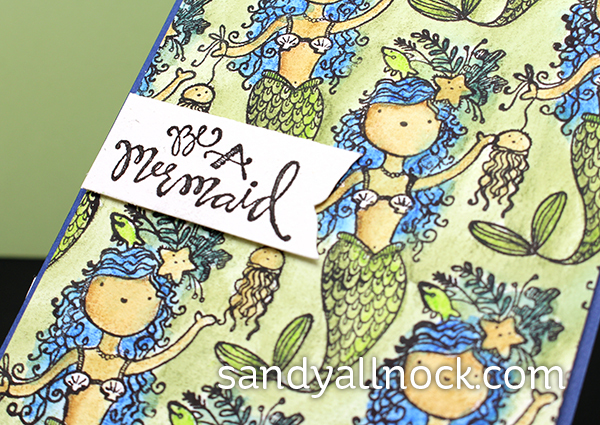 Adorable card Sandy…love to watch you color!!! Love this little image Sandy. Thanks for sharing with us.